Home / How to Hard Rest Android ACER Iconia Smart S300? / How to Hard Rest Android ACER Iconia Smart S300? by Sunil Jadhavar on March 04, 2017 in How to Hard Rest Android ACER Iconia Smart S300? You may perform a clean boot to restore your smartphone to the factory settings. Note : Before performing a reset, ensure that your smartphone is not locked. Press any key or tap the screen to see if the phone responds. Warning! You should only perform a clean boot when all other options have failed to restore your smartphone to an operational state. Warning! This will erase all your personal information, any contacts stored on your phone and any programs you installed. 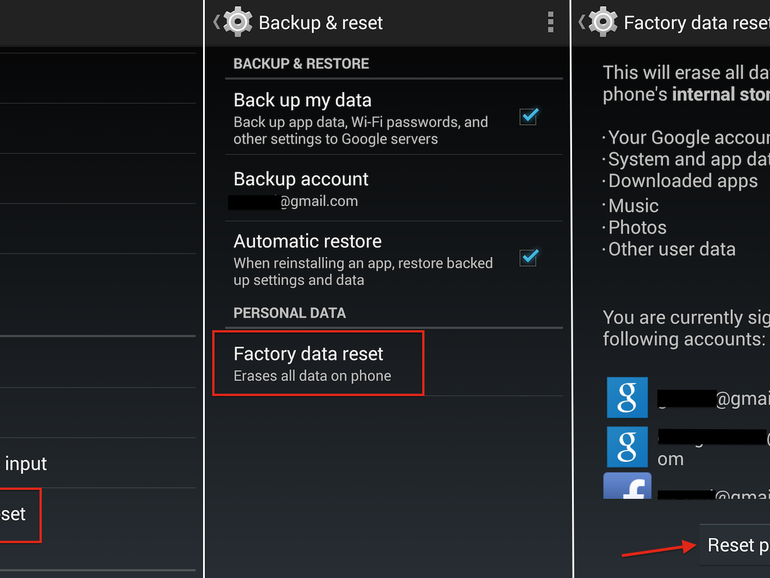 Open Settings from the Applications menu, then tap Privacy > Factory data reset; click Reset phone and then Erase everything to format your phone. After a certain number of wrong entries, you will be presented with an option to reset your pattern. Tap Forgot pattern? and enter your google account username and password. Note : You must have an active Google account on the smartphone. How to Android device hard reset recovery using ADB? Tags # How to Hard Rest Android ACER Iconia Smart S300? Labels: How to Hard Rest Android ACER Iconia Smart S300?